New album with track-listing announced for June. 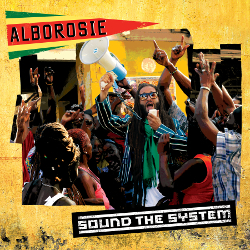 After the eclecticism of third vocal solo album ‘2 Times Revolution’, Sicilian reggae star Alborosie has been signposting a return to roots and culture. This summer his European followers can find out if new long-playing release ‘Sound The System’ is it. Bearing a striking cover photograph of Albo in a striped jacket shouting to a crowd through a megaphone, ‘Sound The System’ will be distributed by Greensleeves.